1929 WIEST,Edward 3 Feb 1858 Rohrbach,Russia 24 Nov 1925 Beulah, N.D.
1930 REICHERT,Anna Marie 29 Aug 1860 Rohrbach,Russia 11 Dec 1953 Hettinger, N.D.
1931 WIEST,Gustav 5 Aug 1896 Johannestal,Russia 22 Mar 1971 Vallejo, Calif.
1932 WIEST,Lydia 8 Feb 1897 Johannestal,Russia 10 Aug 2001 Bismark,N.D. 1933 WIEST,Emanuel 17 Sep 1899 Johannestal,Russia 3 Apr 1967 Hettinger,N.D. 1934 WIEST,Edward 15 Jul 1901 Johannestal,Russia 20 Jan 1987 Laurel,Mont. 1935 WIEST,Rose 7 Nov 1904 Johannestal,Russia 21 Mar 1993 Bismark,N.D. Built by Blohm & Voss Shipbuilders, Hamburg, Germany, 1899. 10,058 gross tons; 520 (bp) feet long; 58 feet wide. Steam quadruple expansion engines, twin screw. Service speed 14.5 knots. 3,451 passengers (369 second class, 3,082 third class). Built for North German Lloyd, German flag, in 1899 and named Rhein. Bremerhaven-New York, Baltimore, Philadelphia, Suez Australia service. Laid up at Baltimore 1914-17 owing to World War I. Transferred to US Government, in 1917 and renamed USS Susquehanna. A troop transport. Chartered by United States Mail Lines, American flag, in 1920. Began commercial service. 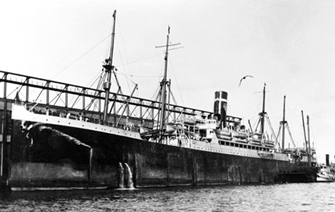 Transferred to United States Lines, in 1920. Laid up 1922-28. Scrapped in Japan in 1929.